The Social Studies initiative is guided by open process. 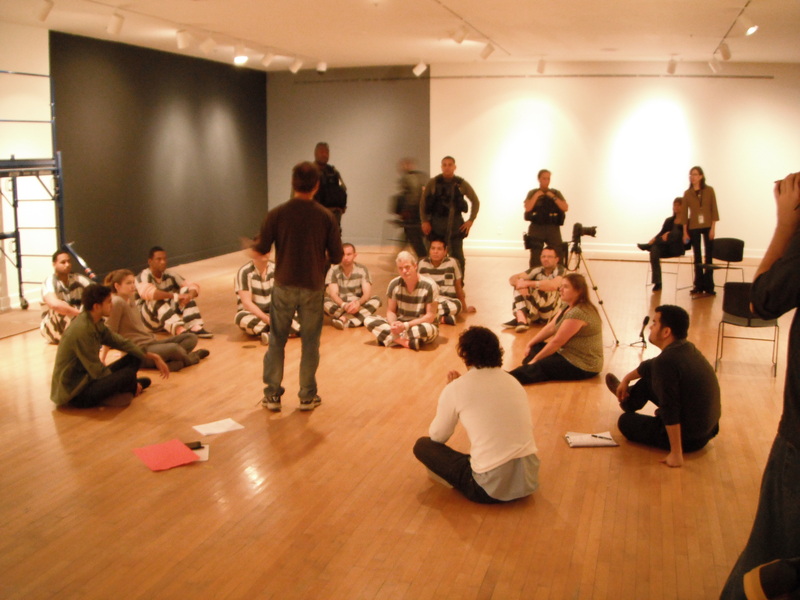 Whether it was the fully democratic creative process driven by artist Jarbas Lopes, the opening of the decision making process allowed by artist Josh Greene, or exposing ourselves to the new state of the economy and housing crisis through the volunteer vampire and zombie actors trained and directed by artist Jillian Mcdonald, active participation has always been key to Social Studies’ success. 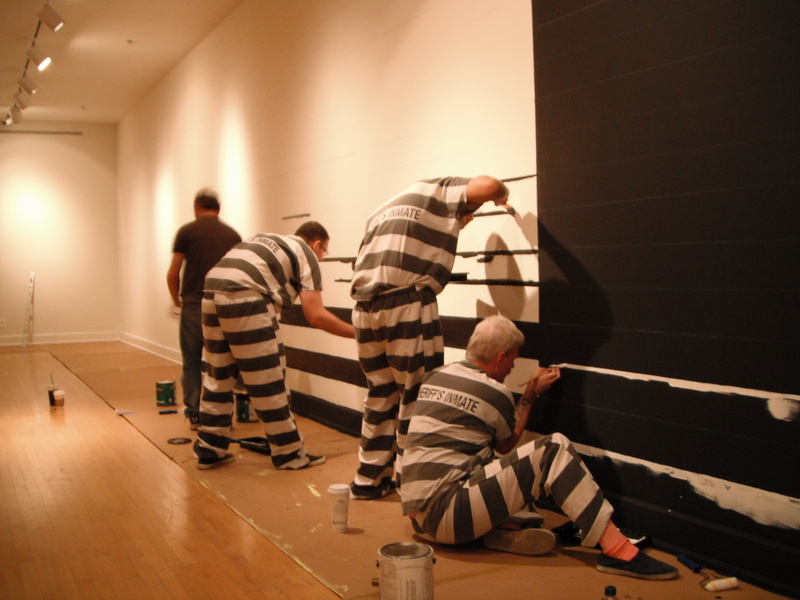 Over the past couple of months, in preparation for Social Studies Project 6 with Gregory Sale, the artist and I have been visiting correctional institutions and organizations involved with all aspects of justice. 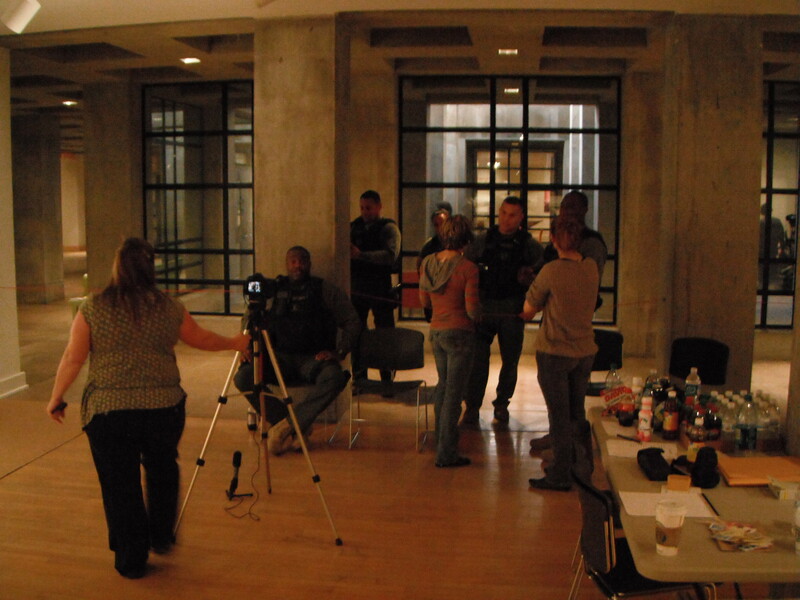 We’ve been inside the Florence and Eyman State prisons, The Towers county jail complex, and the Maricopa County Sheriff’s Office. I’ve had the great fortune to meet with individuals involved with the GED education, Legacy and ALPHA programs inside the system. 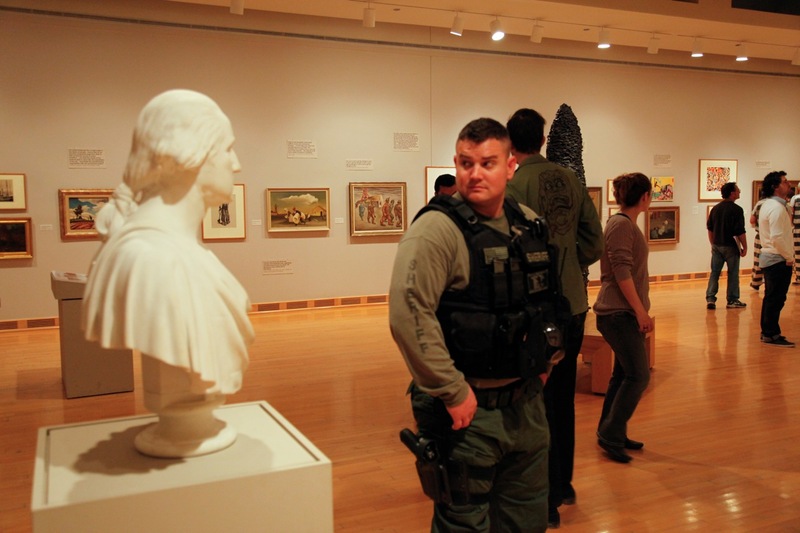 We’ve had members of their teams here in the museum, working on logistics planning to insure positive results. We’ve met with the leadership of Gina’s Team, an independent inmates’ needs organization; University of Arizona professor Richard Shelton regarding his Creative Writing Workshops at the Arizona State Prison; dancers and choreographers working with Journey Home and Girl Scouts Beyond Bars; and members of social justice and human rights organizations. I’ve met passionate people, working both inside and outside the system, involved with these programs, and heard from both facilitators and participant of their benefits. Gregory has orchestrated these visits, and, without his passion, openness, dedication and hard work, these connections would not be possible. This process has allowed us to have direct conversation with those involved in the programs from a different perspective: the instructors, the supervisors and the participants. We have met with them, explained what we were up to and the overall vision for the project. We’ve asked for volunteers, giving them all the details we possible could and providing them every opportunity to opt out if they did not feel comfortable. Working with Gregory has provided a unique opportunity. He is an artist of our very own community, one who has been actively involved in performance and social practice since the mid-90s, when he and I first met. As an artist and educator, he has been an active participant in the Social Studies series from the beginning, engaging his students with each visiting artist during their six-week residencies. With his background as a former charter arts high school teacher, a curator of education, an employee of the Arizona Commission on the Arts and currently an Assistant Professor of Intermedia at ASU’s School of Art, his connections to the community are established and strong. He is truly someone I trust and respect. The fact that Gregory is a local artist has allowed the first opportunity in the Social Studies initiative to extend the residency from six weeks to three months. As I stated in the title of this post, you can’t move forward until you know where you are, so this is where things start within the museum gallery structure with Social Studies Project 6. 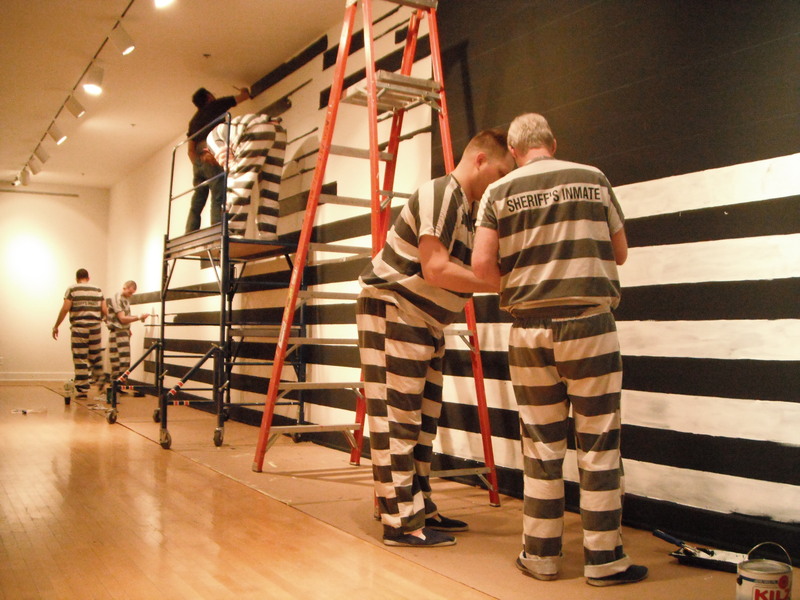 It’s not just black and white begins with the current state of corrections in the U.S. and Arizona, most specifically Maricopa County. We know it’s extremely complex, and when these issues are raised in public settings the discussion often becomes heated and passionate. It comes from all directions, and we’ve heard it so many times, comments like, “You must not be tough on crime,” “You’re acting like a victim,” “They have been victimized,” “It’s an issue of public safety,” among many others. Each of us comes to the conversation with our own backgrounds, stereotypes, perceptions and prejudices. The messages get driven home to us through media and other sources, but so rarely are our own opinions based upon direct experience. The passions needs to be there, but with respect and knowledge. The respect for differing opinions, the respect for differing situations, the respect for the individual, the respect for one another as human beings, and the knowledge that comes from firsthand experience. It’s my opinion that conversations can only move forward when everyone is welcome at the table – those with different knowledge bases and from different backgrounds, with diverse experiences and insights. 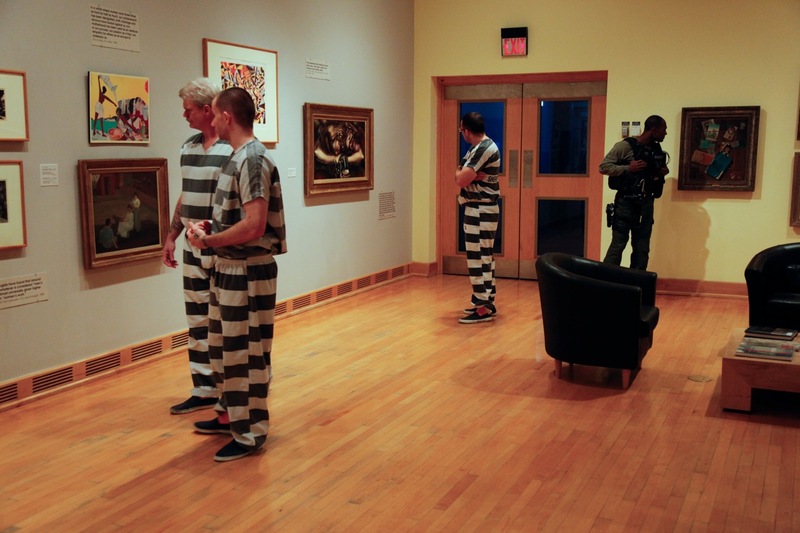 This past week we began the in-gallery activities of It’s not just black and white. 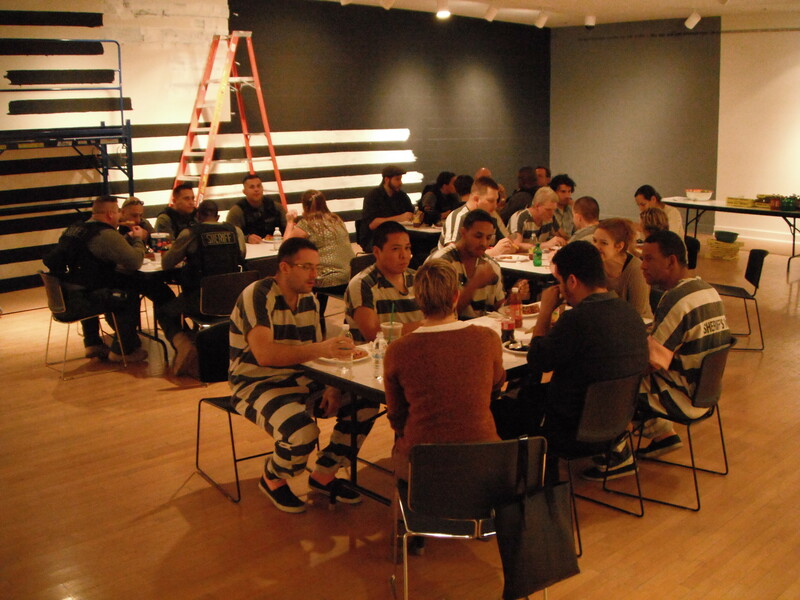 We invited inmates from the Maricopa County Jails’ ALPHA Program to join us at the Museum. 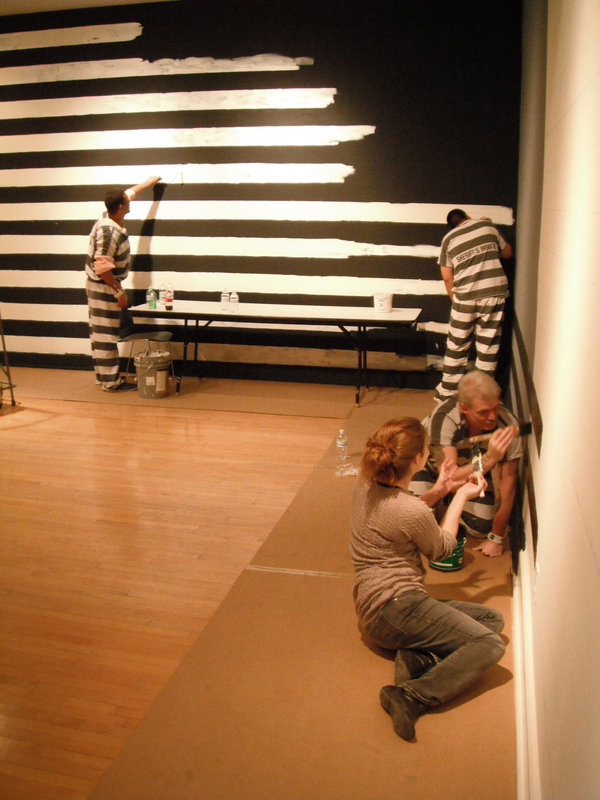 They worked as artistic collaborators with Gregory and his team of current and past students as part of the residency, all volunteering to participate in the project. 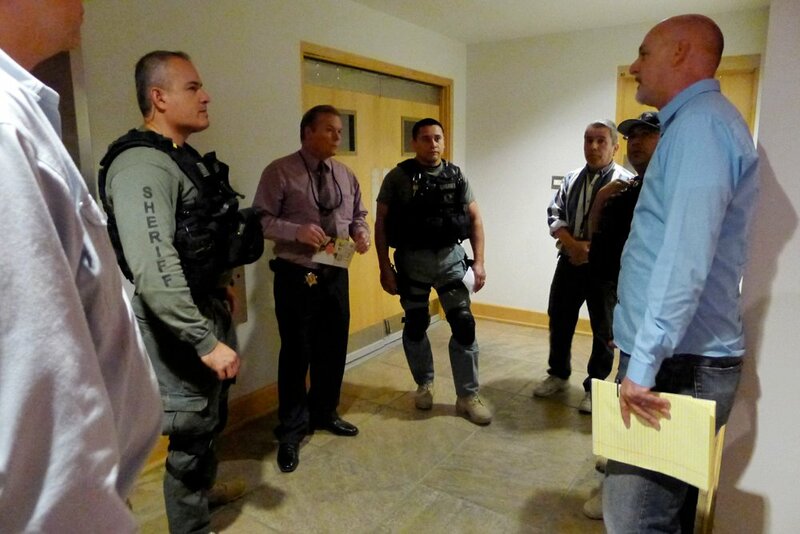 Background checks were run by MSCO on all participants, and MCSO officers were present to insure public safety. 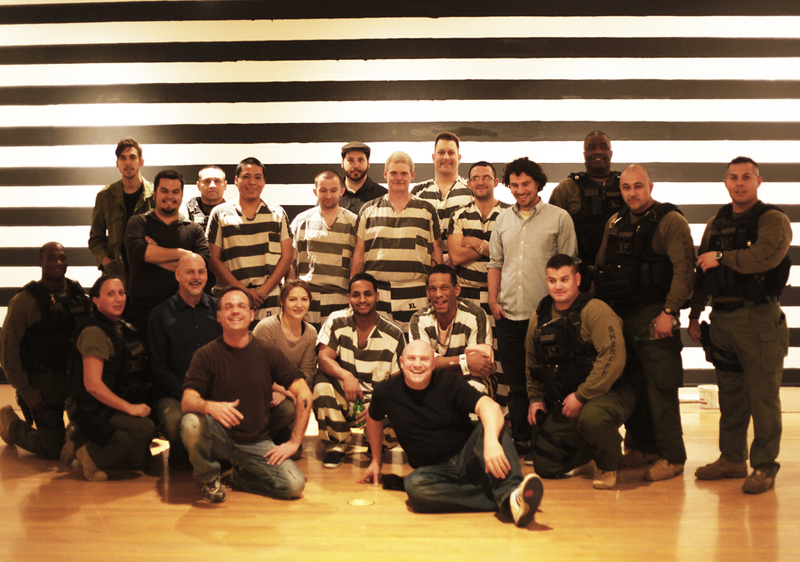 The ALPHA is a re-entry and rehabilitation treatment program, designed to reduce crime, recidivism and substance abuse. We started the day with a brief introduction and again, explained that if there were any components of the project anyone was not comfortable with, there was no obligation or pressure to participate. We took everyone together on a museum tour. We shared works from the Re-Thinking the Faculty Exhibition being installed, our Americas Gallery permanent collection, and the FUNd exhibition. We talked about the complex works of Jon Haddock, artists from CUBA, Deborah Butterfield and the art and society focus of our institution. We returned to the gallery and took coffee and soda orders from all present, then got to work. When the drinks arrived, we distributed them, but the work continued. We took a break for lunch, sitting together to enjoy a meal and continued getting to know one another, talking honestly and openly. As you can see from the images posted (and slideshow below), it was a day of activity, conversation and building relationships – group discussions, one-on-one opportunities, introducing collaborators to members of our community who are part of Gregory’s advisory committee. 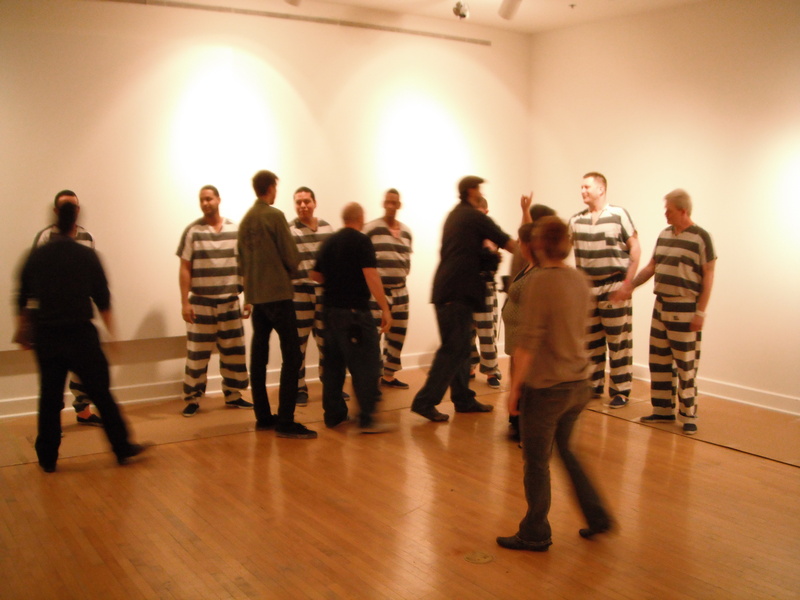 The week started at the current state of corrections, but quickly moved into the building of relationships, open dialogue and direct experiences. Through participation, continued open dialogue, performances, lectures, panels, tours and artistic gestures scheduled over the coming months, it is my hope that these conversations and experiences will continue to move forward in positive directions and with positive outcomes. 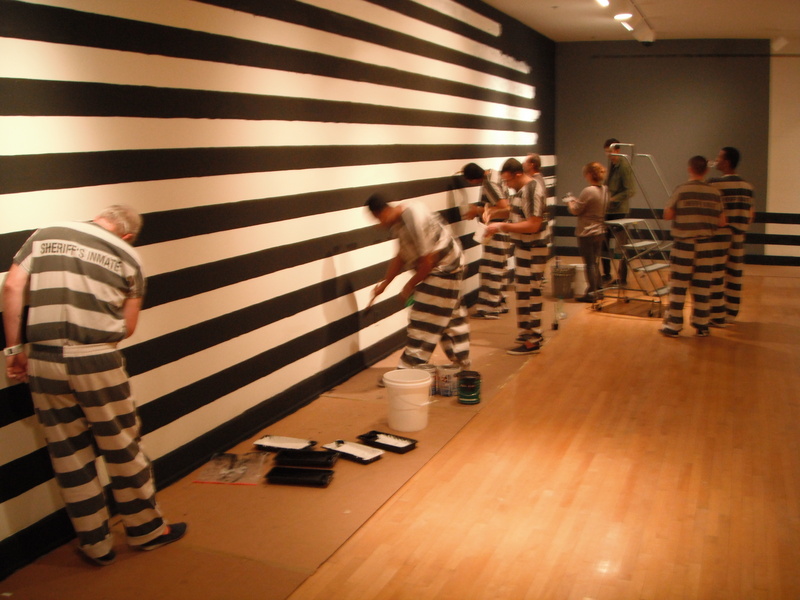 As It’s not just black and white moves forward, you will continue to see activities taking place in the gallery and throughout the community, both scheduled and improvised, that build upon this conversation. Gregory’s official website for the project will go live this week, so I will make sure to post a link on our blog when it’s ready. He’ll be posting schedules, tour sign-ups, images and much more, as we will continue to do as well on our own blog, website, Facebook and Twitter accounts. Everyone is welcome at the table, so I strongly encourage you to visit the gallery at several different times during the course of the three-month residency, to get a sense of the project as a whole. The outcome of the project depends on your involvement and your input. 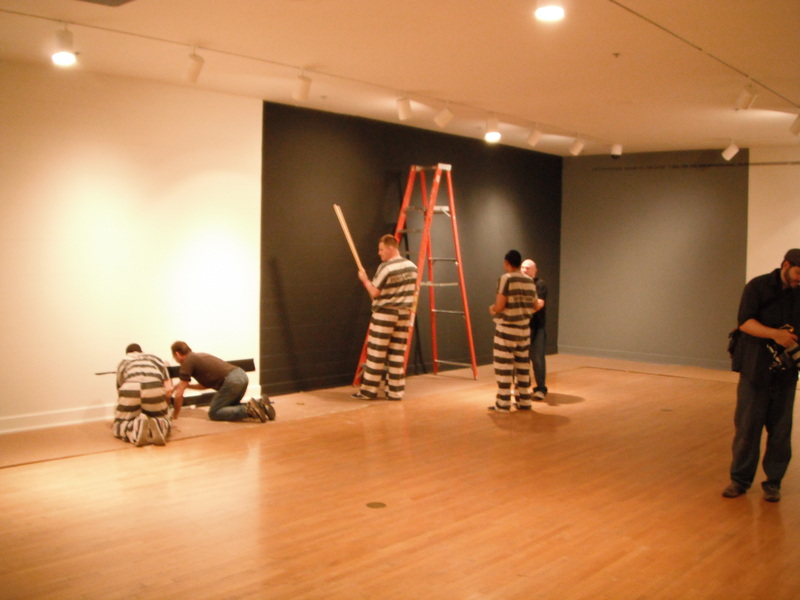 A good place to start is by attending the ASU Art Museum Season Opening Reception which takes place this Friday, February 18 from 7-9pm – it’s free for everyone! I look forward to your participation, insight and knowledge moving Social Studies and issues of our community forward! Olympic Gold Medalist, Gina’s Team and PVCC Students! Entry filed under: Art + Performance, Art Events, Art Trips, Artists at the Museum, ASU Art Museum, ASU Art Museum Press, ASU Art Museum special events, Exhibition Openings, Gregory Sale, Lectures at ASU Art Museum, People at ASU Art Museum, Random Acts of Art, Social Studies collaborative projects, Studio Tours, Uncategorized. 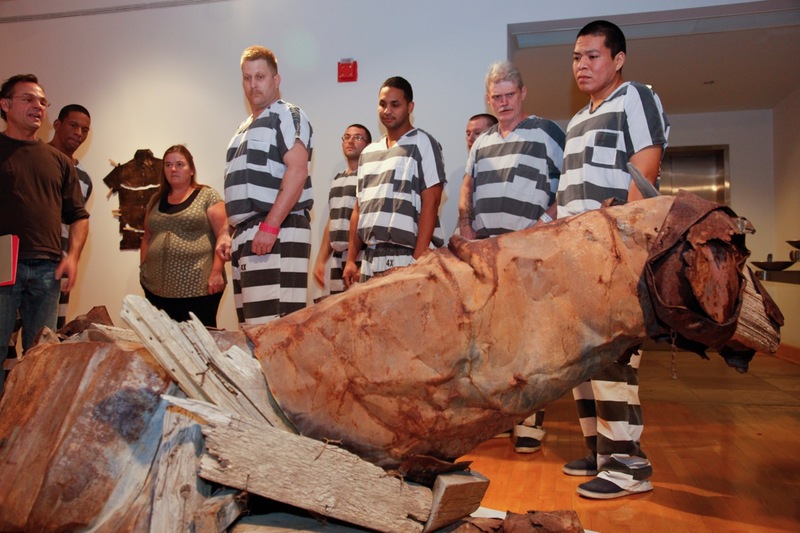 Tags: ALPHA, Americas Gallery, Arizona Commission for the Arts, art, ASU, ASU Art Museum, ASU School of Art, Cuba, Deborah Butterfield, Eyman, Florence, FUNd, Gina's Team, Girl Scouts Beyond Bars, Gregory Sale, It's Not Just Black and White, Jarbas Lopes, Jegacy, Jillian Mcdonald, John Spiak, Jon Haddock, Josh Greene, Journey Home, Maricopa County Sheriff's Office, MCSO, Re-Thinking the Faculty Exhibition, Richard Shelton, social practice, Social Studies, The Andy warhol Foundation for the Visual Arts, The Towers. Spring Season Opening Reception! Olympic Gold Medalist, Gina’s Team and PVCC Students! I attended the roundtable event last night, to get another prospective on mental health issues. It was not what I expected, to say they least, but then, I really didn’t know what to expect. mental ward if they’re not going to put him in jail, and turn him lose because now he’s “normal” on meds.Fix them before they murder, I know what he can do when he’s not medicated, and no family should have to enure this pain. What a great project, and how relevant to Arizona right now. I’m looking forward to following this over the next few months. Hopefully this will get some attention and lead to better things for the state, and the country. Thank you for taking up this important cause! Congratulations. What a great project. I am excited that someone is taking on this issue- especially appropriate and relevant in AZ. I look forward to following the Blogs and seeing how the project evolves. I imagine it will manifest in a series of very personal series of shifts….that hopefully will spark some long-term societal change. Good luck! and Kudos! i really like the activity . . .and iud like to be in touch . . . . .
woow great .. .. . . .
Congratullations. GINA’s Team is grateful that you are starting this conversation in an amazing space. We feel strongly that positive discussions and a new awareness will result.